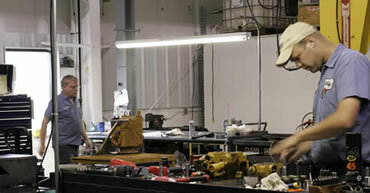 The employees of Complete Hydraulic Service are the key ingredients to the continued success of the company. From the sales reps and technicians who work closely with our customers, to the "behind the scenes" staff who support them, it's our people that make our company strong. Current Positions are listed through the Ohio CAT job portal at the link below. Please note: our Careers site includes opportunities available through Ohio Machinery Co., which includes Ohio Cat Equipment Division, Power Systems Division, Ohio Ag Equipment, Complete Hydraulic Service, and SITECH systems. Please view the location on the job types to determine which opportunites are availible for Complete Hydraulic Service in Bolivar, Ohio.